In a series of postgame remarks following the Cleveland Cavaliers’ victory over the San Antonio Spurs, LeBron James gave a strong endorsement of the efforts of the team’s new head coach, Tyronn Lue. Whether or not that changes during the inevitable bumps in the road in the weeks and months ahead (especially during the postseason) remains to be seen. 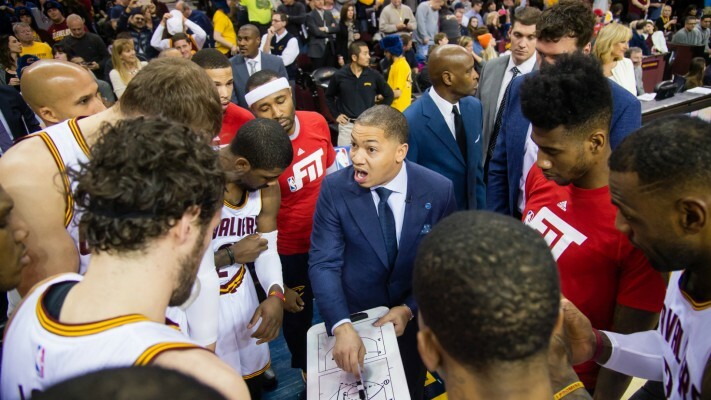 Yet James’ comments seemingly indicate that the team is fully behind Coach Lue in their quest for an NBA title. “I think Coach Lue has done a great job clearing the air of what he expects out of all of us, including Kev, and he’s a big focal point of our team,” James said. With a 34-12 record, the Cavs continue to be atop the Eastern Conference standings. The win over San Antonio (albeit without Tim Duncan in the lineup) was an important victory, given the potential fact that the two teams might end up facing each other in the NBA Finals. The fact that the victory came against an elite team can only help bolster Cleveland’s confidence, considering they’ve dropped both games this season against the Golden State Warriors and Chicago Bulls. Being in sync with the coaching staff looks to be a newfound asset that the Cavaliers can build on for the remainder of the regular season, something that James has made clear through his comments.